Getting to and from the train is not an enjoyable experience. Train stops are not always conveniently located, scooters are not a practical transporter as it is hard to fit a scooter in your bag, and bikes are not allowed on trains forcing riders to to risk having their bike be stolen. So, we set out to create an “enhancement” to the T riding experience that was fast, compactible, and lighter than the existing ways of getting to and from the train. From the beginning, we intended to create a device to enhance the T, what we believe is an already existing and functioning mode of transportation. We had no intentions of creating a device to replace the T riding experience. With this in mind, we set out to design the Transit-Wheel (formerly reffered to as MonoBird). In this studio, we aimed to continue the development of the Transit-Wheel. We looked to add electronics, work out some design kinks, and make it a more desirable product. Indeed, we used this studio as a way to enhance the Transit Wheel’s functionality. The Transit-Wheel is a small, light, compactable transportation device designed to enhance the T experience. The single wheel in the center allows it to be light and small. The folding wings make the Transit-Wheel compactable and easy to carry. The T is a great way of transportation that works well and efficiently, and we’re not trying to replace that. We’re trying to make it better, faster, and more enjoyable. The Transit-Wheel has hands-free segway technology. The wings are foldable creating a backpack sized travel mode. The Transit-Wheel originated as a transportation device for college students or young adults. It gradually transformed into a device for everyone and anyone. The Transit-Wheel has developed immensely over the course of the second studio. While improvements are crucial in that the wheel needs to be re printed out of a stronger material, the gear needs a few adjustments, and we need to make it more street safe, the future is clearly bright. Getting to and from the train is not an enjoyable experience. Train stops are not always conveniently located, scooters are not a practical transporter as it is hard to fit a scooter in your bag, and bikes are not allowed on trains forcing riders to risk having their bike be stolen. So, we set out to create an “enhancement” to the T riding experience that was fast, compactable, and lighter than the existing ways of getting to and from the train. From the beginning, we intended to create a device to enhance the T, what we believe is an already existing and functioning mode of transportation. We had no intentions of creating a device to replace the T riding experience. With this in mind, we set out to design the Transit-Wheel. With this iteration, we heavily focused on the body of the transit wheel. We set out to design an aesthetically pleasing, sturdy, and powerful wheel cover. We smoothed the corners out to make for easier turning. With the new design, a rider could make a sharper turn without brushing the ground. We also redesigned the wheel cover so that it had an open top and bottom. This would prevent debris from getting entangled in the wheel. Additionally, we made the device more accessible by adding magnetic handle bars. The handles, could be easily connected when the wings closed, not only creating a handle for easy carrying, but also folding the wings up and keeping them secure. With this iteration, we also considered how to pack and secure our electronics. We challenged ourselves with using as little surface area as possible and packing the electronics as densely as possible. Finally, we revamped the wings. We got rid of the double folding design so that it was more simplistic. This allowed us to make the wings even smaller, reducing excess weight and space. Indeed, we heavily revamped the body to push the transit-wheel to the next level. In this iteration, we pushed ourselves to redesign the wheel and the spring hinge mechanism. We started by reimagining the wheel. We designed a larger wheel that had a gear in it. The gear was there so a motor with another gear would spin the wheel. The first model was designed very badly so we improved it. The new model find a lot of little problems. the new wheel was much better and ready to be printed. Next I worked on the hinge, the hinge had to have springs in it that fought the wings from going down. The hinge also had to be strong and look good. I started with cutting prices of spring steel and bending them to 90-degree angles. The plan was to have the springs be clamped between the wing and the hinge. The new parts in iteration two bring together the transit wheel. 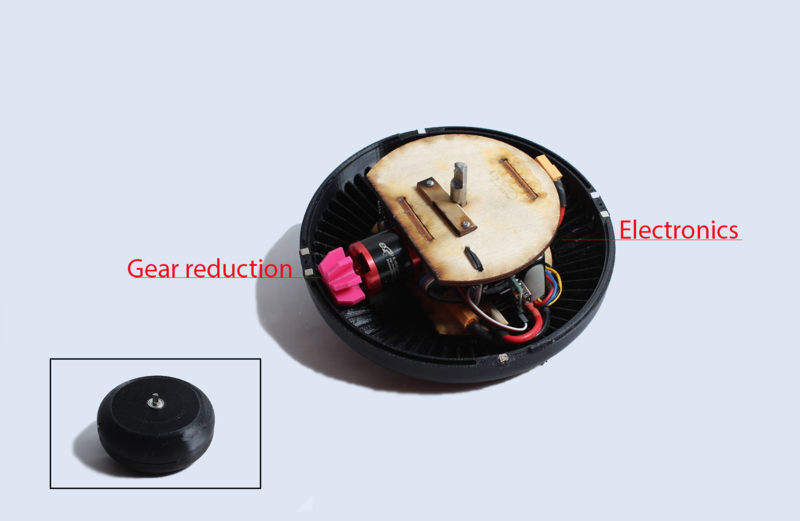 In order to pack all of the drive electronics into the wheel, we decided to use a compact brushless motor typically used for RC planes. Unfortunately, its small size comes at a price. Such motors are high-speed, but low torque. In order to adapt this motor for our design, we needed a gear system. Our idea was to embed a large beveled gear into the cover of the wheel which touches the ground, and a smaller beveled gear in the core of the wheel where it would be attached the motor. The process of designing the gear involved a lot of trial and error. We went through three major iteration the smaller beveled gear the larger bevel gear and the spiral gear: Each time making small corrections in the shape of the teeth, the spacing, and/or the angle of the teeth. We ended up not using the spiral gear because the equations that govern its design were too complicated to reproduce through trial and error. Instead, we adopted an older gear design for the motor-mounted gear and cut its teeth to be shorter. Beyond the gears, we also had to work on the electronics which constitute the control system. Designs were complicated by not being able to source components and circuits not working as predicted. At the beginning of the studio we thought that we were going to use pressure pads to control speed.. Despite looking all over the internet we couldn’t find them, so we had to resort to an accelerometer. The issue with this is the accelerometer is it is less accurate at measuring the tilt and it is more of a challenge to program. We also needed to make the uni-directional motor controller, bi-directional so the wheel could spin forwards and backwards. To do this, we made a board to controllably reverse the current going to the motor using relays. Unfortunately, the relays we used ended not being able to pass-through the high-frequency, high-current power required by the motors, so we abandoned its use in the final design.